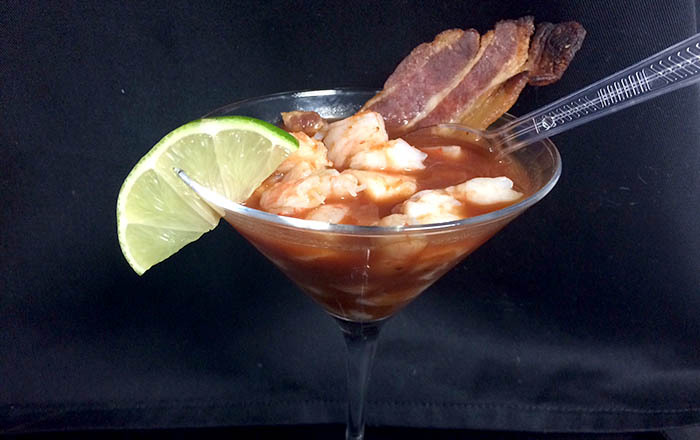 Our Food Schmooze® Shrimp Cocktail Bloody Mary! Is there a better way to start a party? As soon as guests arrive, hand each one a Food Schmooze® Shrimp Cocktail Bloody Mary. Chill a pitcher of your favorite Bloody Mary mix, store-bought or homemade, with vodka. Then chop cooked shrimp and fill the glass with the shrimp, half-way. Add the Bloody Mary mix to the shrimp in the glass and top the whole thing with a generous amount of chopped crispy bacon bits or use a single bacon strip as a swizzle stick. Hand each guest a spoon. Welcome to the party. You can skip the vodka and make a pitcher of shrimp cocktail mocktails for kids and non-drinkers, too. ON-DEMAND: Listen to Faith and the gang talk about this fun appetizer/cocktail during an episode of the show.